The PBG Predator’s adherence to the age classification changes is based upon literal guidelines for age denominations as detailed in the chart below and our philosophical approach to development. There will be mandatory changes governed solely by the year in which a child was born. The PBG Predators, like other clubs, have no say in this matter. Many cases will result where players are viewed as skipping an age group. For instance, a player on the older end of his or her current team with a birth date between Aug. 1 and Dec. 31 will transition to an age group that is two levels above their current team. Example: Marissa is an Under-12 PBG player born in October 2003. She will NOT be eligible for U-13 events in the coming soccer year under the new alignment based upon her birth year. 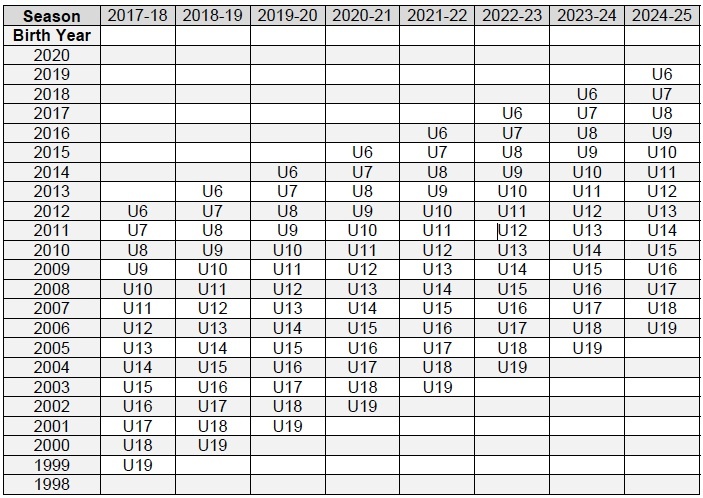 Players born in 2003 will instead be identified as U-14 players for the 2016-2017 season. Marissa's current U-12 teammate, Audrey, was born in January 2004. Audrey is eligible to play U-13 under the new alignment. She may also be pulled up to play with an older age group if the PBG Predators feel this is beneficial to her development as a player (see Philosophy). Level within the standard – We will recommend that players are placed in the appropriate birth year team age group. This approach will provide long term success for the individual, verses the short-term past team placement. 2) High School graduation year – Players from the U-15 age group and above will be identified/recruited against players from the same graduation year to mirror the practices of college coaches making decisions for their recruitment classes. Players in this ‘Advancement’ stage of the PBG will be primarily placed on rosters to compete alongside players from the same graduation year. PBG Predator's Director of Coaching and coaching staff will make recommendations to all current players in advance of upcoming tryouts regarding the appropriate age groups to attend for the 2016-2017 soccer year. Additionally jamboree games will provide an opportunity to show staff performance. These recommendations will be based upon the standard birth year of the player, detailed above for younger age groups. High school graduation years will also be considered for U-15 and above. Example: Frank is a current PBG Predator's U-11 player born in March 2005. Some of his teammates will move to U-12 upon the transition. Some will jump to U-13 (those born in 2004). Frank remains eligible to play U-12 during the 2016-2017 season as this group will be primarily comprised of players born in 2005. We recommend that players attending the PBG Predator's tryouts that are not currently involved with our program are registered for the tryouts correlating to the child’s birth year (in accordance with the chart attached). Our PBG Predator's DOC and coaching staff may recommend that all players attend the appropriate birth year age and be evaluated against other 'same' age group based upon their performance. All players entering the program at U-15 and above should contact our DOC in advance of the tryouts for recommendations based upon graduation year and prior playing experience.